So, you’re looking for a new piano. Perhaps you’re just starting to play the piano and are looking for your first keyboard. Or you are already playing for a while and you want to upgrade your piano. Whether you are a beginner, an intermediate player or even an advanced or professional player, it’s not always easy to decide which piano or keyboard to acquire. This article will help to find the best piano or keyboard for you. Acoustic piano or electronic keyboard? How do electronic keyboards imitate a real piano feeling? What types of electronic keyboards exist? The first question is: do you need an acoustic piano or an electronic keyboard? it doesn’t disturb neighbors or others in your house. Why an acoustic piano? That’s because the feeling of the keys and the sound are that of a real piano. Nowadays, good digital pianos have piano sounds and a feeling that come very close to that of a real piano, which means that the choice for a digital piano instead of an acoustic piano is a legitimate one. If the money is the only issue, you could consider to buy a second hand piano. But keep in mind that an acoustic piano has to be tuned once or twice a year, which can be quite expensive too. If you want to buy a new acoustic piano, go to your local piano or music store, the people there will be glad to advice you in your choice. If you are more interested in an electronic keyboard, you will find all the necessary information in this article that will help you to decide which model to choose. 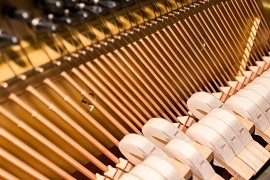 In an acoustic piano, a hammer strikes one, two or three strings. The hammer is connected by a lever system to the key. This causes a resistance when playing the key and this is the typical ‘piano feeling’. Cheap keyboards and most synthesizers don’t imitate the real piano feeling: when playing the keys on such a keyboard, you don’t feel any resistance like you would feel when you play on an acoustic piano. Here, a spring is attached to the key to give it some resistance when playing. Here, the resistance comes from a small hammer connected to the key by a lever system, replicating the mechanism found in acoustic pianos. The same system as in ‘hammer action keys’ is used, but now more resistance is encountered when playing lower keys and less when playing higher keys, like in acoustic pianos. For a (beginning) piano player, it is important to have at least a keyboard with piano feeling. So a semi-weighted keyboard is the absolute minimum. Better is, of course a keyboard with hammer action. Other functionalities in electronic keyboards that imitate acoustic pianos are velocity sensitivityA keyboard with velocity sensitive keys responds to the speed of the key-press. A higher speed results in a louder note. This imitates the acoustic piano where the speed of the key-press determines how fast the hammer hits the strings which changes the volume of the sound. Apart from very cheap toy pianos, practically all the modern electronic keyboards are velocity sensitive. and aftertouchMost electronic keyboards respond to the pressure applied after hitting the key. This is called aftertouch. Aftertouch is often used to control vibrato, volume or other parameters..
An acoustic piano has 88 keys. 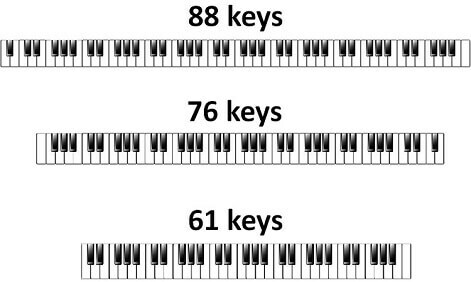 Digital pianos try to copy their acoustic equivalents and have therefore also mostly 88 keys, but other types of electronic keyboards don’t necessarily always have 88 keys. There exist keyboards with 49 keys, 61 keys, 73 keys, 76 keys and of course 88 keys. As a piano player, I would recommend an absolute minimum of 73 keys, but personally I would go for an 88-key keyboard, unless you have to transport it often (for example for gigs). When you perform often on stage, the weight of an 88-key piano might be an obstacle, so in this case you could opt for 76 or 73 keys. 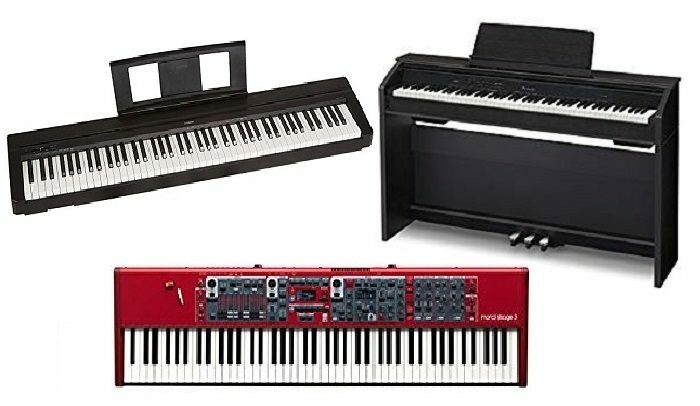 For piano players, the first category (digital pianos) is the one that really interests us, so the types of keyboards that I will review below will all be in that category. I will however also explain the other keyboard-types so that you will have a good understanding of all the available electronic keyboards on the market. For a piano player, this is without doubt the most obvious choice. Digital pianos offer a variety of piano sounds and also other sounds like organs, harpsichords, strings and (vintage) electric pianos (like the Fender Rhodes, for example). Compared to other keyboard-types, the number of different sounds is perhaps limited (synthesizers have many more sounds than the above-mentioned sounds found in digital pianos), but the sounds on a digital piano are usually of better quality in order to mimic a real piano. Also, the feeling of the keys (weighted keys) is more that of a real piano (synthesizers very often don’t have weighted keys). A digital console piano is an upright or vertical piano that is built on a wooden frame so that it looks like a real upright piano. It usually also has pedals integrated. The sound comes out of built-in speakers. It is also possible to connect head-phones so that you can play without disturbing your neighborhood. Often, a direct output is provided to connect the piano to an external amplifier when playing on stage. For home use, a console piano is an ideal choice. A stage piano generally offers the same sounds as a console piano. A stage piano, as its name suggests, is for use on stage. This means that portability is of great importance and that is exactly what makes the difference with console pianos: stage pianos don’t have a wooden frame. A stage piano therefore has to be placed on a keyboard stand (or eventually on a table). Pedals are not integrated, but it is possible to connect pedals to the stage piano. Often (but not always), a sustain pedal is included with a stage piano. Stage pianos can have built-in speakers, but especially the more high-end stage pianos don’t have built-in speakers and need to be connected to an amplifier with speakers, or simply to head-phones. When you are a beginning piano player, you would typically go for the first price range. Advanced and professional players are better of in the last price range. When you already play for a while, but you’re still playing on a beginners keyboard and you’re looking for an upgrade, the middle price range is perhaps where you would search for a new piano. Since some digital pianos (especially those in the higher price range) don’t have built-in speakers, I will also make some recommendations for powered speakers (studio monitors) that you can use with your digital piano. The Yamaha P45 is a very good keyboard for beginning piano players. The piano has 10 preset sounds: 2 grand pianos, 2 electronic pianos, 2 organs, strings, 2 harpsichords and a vibraphone. The MIDIMIDI (Music Instrument Digital Interface) is a protocol for the communication of sound information between a sending device (for example a MIDI keyboard) and a device that receives the information and produces sound (for example a sound module). The information doesn’t contain the actual sound, but information of which note is played, how long it is played, which instrument is played, and so on. functionality of the P45 is available through a USB connection, which allows you to connect the P45 to a computer. The polyphony of the P45 is 64 voices. The P45 has 88 weighted keys with graded hammer action that has a heavier touch in the low keys and a lighter touch in the high keys which mimics the feel of a real piano. The dual mode function lets you combine two sounds together; it’s for example possible to combine a piano with strings. The duo mode function splits the keyboard in two parts which allows two people to play at the same time. This is very useful for piano lessons with a teacher. The P45 comes with 2 integrated 6W speakers and has a weight of 11.5 kg (25 lbs). The Yamaha P115 is Yamaha’s best digital piano in this price range. And it’s for that reason that the P115 is one of the most popular digital pianos on the market. It’s a bit more expensive than the P45, but the extra cost is worth it every cent. The P115 has 14 preset sounds (4 more than the P45): 3 grand pianos, 3 electric pianos, 3 organs, vibraphone, strings, harpsichord and 2 bass sounds. The MIDI functionality of the P45 is, like that of the P45, available through a USB connection. The P115 has the same 88 weighted keys with graded hammer action as the P45. The polyphony is better than that of the P45: 192 voices instead of only 64 in the P45 (which is 3 times as many!). As the P45, it has the dual mode and duo mode functions (see the Yamaha P45 for explanation). The P115 has the possibility to connect external (powered) speakers to its AUX outputs. An extra feature, not available in the P45, is the ‘sound boost’-feature. When playing together with other instruments, you can give the piano an extra ‘boost’ so that it is better audible and the piano doesn’t get lost in the overall band sound, which is a great option for live performances. Another option that is not available on the P45 is the ability of the P115 to record what you’re playing. This is especially useful when learning to play the piano. The P115 has 4 integrated 7W speakers and it has a weight of 11.8 kg (26 lbs.). Another great digital piano for beginning piano players is the Casio PX160. The PX160 has 18 preset sounds: 5 grand pianos, 4 electronic pianos, harpsichord, vibraphone, 2 strings, 4 organs and a bass. A simple effect section with reverb (4 types), chorus (4 types) and brilliance (-3 ~ 0 ~ 3) is also included. It has 88 weighted keys with scaled hammer action and a polyphony of 128 notes. The duet mode allows for 2 players to play at the same time (like the duo mode in Yamaha digital pianos), so this is very useful for piano lessons with a teacher. It’s also possible to layer two voices (like piano and strings) together, just as the dual mode in Yamaha digital pianos. A two track recorder can record and playback your practice and performances. A USB MIDI connection is available for connecting the piano to a computer so that you can for example work with Digital Audio Workstation (DAW) software. The PX160 has 2 integrated speakers, but also comes with line outputs to connect the piano to external (powered) speakers. The weight is 11.1kg (24.6 lb.). The digital pianos in this price range definitively sound much better than those in the previous price range. This becomes clear when comparing the Casio PX860 piano sound to the PX160 piano sound. The PX860 sounds so much more like a real piano than the PX160 does; the sound has more depth and in the same time also more clarity. The PX860 also has a much bigger dynamic range (= the difference between playing loud and playing softly). For a beginning piano player, this piano might perhaps go over budget, but an intermediate to advanced player will for sure appreciate its sounds and features. The PX860 has 18 preset sounds: 5 grand pianos, 4 electronic pianos, harpsichord, vibraphone, 2 strings, 4 organs and a bass. A hall simulation feature simulates the sound as if you were playing in a big concert hall. The piano has 88 weighted keys and a polyphony of 256 voices! The built-in recorder lets you record and playback your performances. With the USB connector, you can connect the PX860 to a computer. Like the PX160, it offers the duet mode which enables you to play with another person (teacher). The PX860 has 4 built-in powerful speakers that allow you to play at a high volume without affecting the sound quality. It is also possible to connect external (powered) speakers to the line output. The Korg SV1 is an absolute fantastic piano when it comes to sound quality, design, and number of preset sounds. The futuristic, cool look of this piano makes that it has a unique design. The SV1 has 36 preset sounds (which is a lot more than its competitors in this price range), distributed over 6 different sound banks with each 6 sounds. Connections with the computer can be made with either a USB connection or with the MIDI IN/OUT connectors. The 88 weighted keys together with the very good sound quality make the SV1 feel like a real piano. Note that there exists also a 73-key version, which might be an option for those who take the piano often to gigs. With the Korg SV1, you can fine tune each sound with the built-in equalizer and by selecting the various effects and amp models. The SV1 doesn’t have built-in speakers, so you will need external (powered) speakers, or use headphones. Since this piano is really a high quality piano, it comes not only with the standard jack outputs, but also with balanced XLR outputs for much better signal transmission. The weight of the Korg SV1 is 45.3 pounds for the 88-key version and 38.5 pounds for the 73-key version. 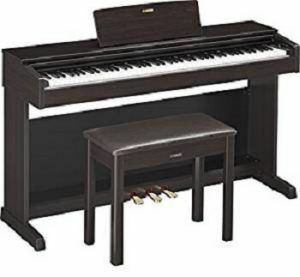 The last digital piano in this price range is the Yamaha YDP143 which has 10 preset sounds to offer: 3 grand pianos, 2 electronic pianos, harpsichord, vibraphone, 2 organs and strings. The YDP143 has 88 weighted keys; its polyphony is 192 voices. The effect section includes reverb, chorus, delay and an equalizer. It has a built-in recorder to record and playback and a USB connection so you can connect it to a computer with Digital Audio Workstation (DAW) software. 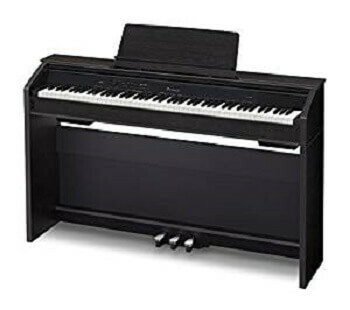 Like a real piano, the Yamaha YDP143 has a heavier touch in the lower region and a lighter touch in the higher region. The duo mode function splits the keyboard into two equal parts so that two people can play at the same time (very good for playing together with a teacher). The dual mode lets you layer 2 voices together (like piano and strings, for example). The YDP143 has 2 speakers. Its weight is 83 pounds. With the Roland RD800 we’re getting into the highest price range. The pianos in this price range are really meant for the more advanced and for the professional piano players. The sounds that come with this kind of keyboards are of professional quality, and the number of sounds is by far superior with normally at least a few hundred different sounds. The RD800 has more than 1100 preset sounds: 34 different piano sounds (from 5 piano-types), 56 different electric piano sounds (from 5 electric piano-types), organ sounds, a wide range of vintage keyboard sounds, many synth sounds and more. A big amount of controls lets you shape each individual sound. All custom settings can be stored for instant recall during performances. Included in the RD800 is a comprehensive effect section with equalizer, reverb, delay, tremolo and amp simulator, a rotary effect for the organ sounds and more. The Roland RD800 has 88 weighted keys and a polyphony of 128 voices. Computer connections can be made with either the USB port or with MIDI IN/OUT connectors. The RD800 doesn’t have built-in speakers, so you will need external (powered) speakers, or use headphones. Like the Korg SV1, it has standard jack outputs and also XLR balanced outputs for better signal transmission. The Roland RD800 has a weight of 21.7 kg (47.7 lb). The Nord Electro 5 is a truly amazing instrument with the most beautiful piano and organ sounds. It includes 3 instrument sections (piano, organ and sample synth) and an effect section (tremolo, wah, phaser, flanger, chorus, reverb, delay, equalizer, amp simulations and more). With the MIDI IN/OUT or the USB connections you can connect the Nord Stage 3 to a computer (for example to use it with Digital Audio Workstation (DAW) software). The polyphony of the Electro 5 is 40 stereo or 60 mono voices. The piano library has a memory of 1 GB and offers a wide choice of preset sounds. It’s also possible to download more sounds from the manufacturer’s website. The organ section contains simulations of among others the Farfisa, the Vox and principle pipe organs and includes rotary speaker simulation. The sample synth section contains a broad selection of free samples, like the Mellotron. The included Nord Sample Editor makes it possible to add any sound you want. This is definitely one of the best digital stage pianos on the market. It includes 3 instrument sections (piano, organ and synths) and an effect section (reverb, delay, compressor…) with morphable parameters. The effect section enables you to customize the preset sounds. The piano library is huge (2 GB) and offers such a wide choice of preset sounds (like Steinway grand pianos, the Wurlitzer, the Fender Rhodes and more), that you would probably not often want to add or replace sounds of the library (it is possible to download more sounds from the manufacturer’s website). The Nord Stage 3 gives you the Hammond B3 tone wheel simulation, rotary speaker simulation and simulations of pipe organs, the Vox Continental and Farfisa Compact. The Nord Stage 3 HA88 and HP76 have LED drawbars for the organ section, whilst the Nord Stage 3 Compact offers real physical drawbars to adjust your organ sounds. The Nord Stage 3’s new Oscillator section features 5 oscillator categories: Classic, Wave, Formant, Sample and brand new Super Wave (S-wave). The sampler gives you the possibility to play pre-recorded sounds. You can also download samples from the manufacturer’s website (or other websites), and it is even possible to load your own samples when you install special software on your computer. If you buy a digital piano without built-in speakers, you will need external speakers with amplification (unless you only want to play with headphones on). For home use you could use studio monitors, which are speakers with built-in amplification that are normally used in recording studios. 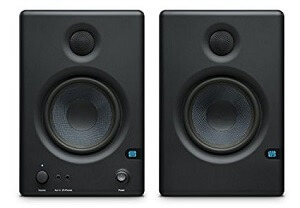 Note that these monitors will not give you enough volume for playing gigs, they are for home use. 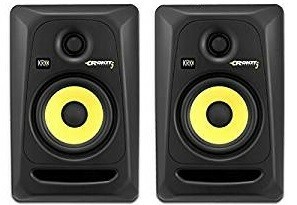 The powered speakers I recommend below are monitors for a (home) recording studio, but can be very well used for your digital piano. Both monitors offer a good sound and don’t cost very much. Affordable, solidly constructed monitors with good sound. The left speaker acts as power amp for both speakers. A bit more expensive than the PreSonus, but with better sound quality. Each speaker has its own built-in power amp. Synthesizers are electronic musical instruments that generate electrical signals which are used to produce their own sounds. Back in the early days, the synthesizers were only analogic. The sounds were produced by combining the outputs of several analogic oscillators into the final sound. In this way, new sounds were created that were totally different from the sounds produced by original musical instruments like a piano, an organ, or whatever other acoustic instrument. Today, digital synthesizers emulate the old analog synthesizers with great precision. In addition, they often provide pre-recorded sounds (samples) like pianos, organs, strings and more. Synthesizers are most often played on the piano keyboard that is integrated with the synthesizer itself, but it is also possible to connect them via MIDI or USB to an external controller like music sequencers, wind controllers, electronic drums, guitar synthesizers and much more. It is even possible to have a digital synthesizer without a keyboard, in the form of a sound module. In this case you need of course an external controller like a MIDI keyboard or one of the other controllers mentioned above. Synthesizers are certainly not the first choice when it comes to learning how to play the piano. This is more for people that like to experiment with different sounds, and use their own created sounds in a band or in a home studio for example. A workstation is a synthesizer with a lot of on-board sounds, combined with a sequencer. You could see a workstation as a complete recording studio built in a synthesizer. With a workstation, it is possible with its built-in sequencer to create a whole band: you write the drums-, the bass-, the guitar- and the piano-part; the workstation will play all the instruments together and you hear your own creation played by a whole band. It is even possible to record audio over it, so you can add voice, acoustic instruments, etcetera. Workstations normally have an internal hard disk to record your productions and often also a CD burner to burn your work directly to a CD. A workstation can be used for composing, recording and producing music. Note that you can do exactly the same thing by connecting a normal synthesizer, digital piano or MIDI keyboard to a computer with a MIDI or USB connection. With this setup, together with sequencing software (the so-called DAW software, or Digital Audio Workstation software) installed on the computer, you have the same functionality as with a workstation. An arranger is a sort of workstation that creates a whole band for you. You enter your chord progression and a style (rock, jazz …); the arranger then plays a whole band in the selected style with your chord progression and you can play over it. This is ideal for one-man bands that need the sound of an entire band. MIDI keyboards don’t produce any sound at all. They’re used to trigger sound producing devices such as synthesizers, digital pianos, workstations, computers with software synthesizers and/or sequencing software (DAW software) and sound modules that don’t have a keyboard integrated. The data transfer from the MIDI keyboard to the sound producing device is established by a MIDI or USB connection. When you have a good sound module, or if you want to use a software synthesizer, a MIDI keyboard is a very good option. Better MIDI keyboards also have weighted keys (semi-weighted, hammer action or graded hammer action). Note that most digital pianos, synthesizers and workstations can also act as a MIDI keyboard. In that case, you wouldn’t use the built-in sounds of your keyboard, but an external source like a sound module, a software synthesizer or another keyboard. Choose a piano bench of good quality and adjustable in height. When the sustain pedal is pressed, every note played on the piano will continue to sound till the note naturally fades out (by the way: some sounds, like organ sounds don’t fade out naturally) or till the sustain pedal is released. A metronome produces a beat at regular time intervals. The beat is set in beats per minute (bpm). A metronome is needed to practice: it keeps your rhythm steady; it avoids speeding up or slowing down the music. Nowadays, metronomes are small digital devices that produce electronic beeps or clicks. They are not very expensive, but to be honest, you can even have them for free: just download a free metronome on your smart phone and you’re ready to go! With headphones, you can even play the piano in the middle of the night without disturbing others. You will need a stand to put your music sheets on. Some keyboards have them integrated. When not, don’t worry, they’re really not that expensive. You can put your keyboard on a table of course, but it’s not very probable that the table will have exactly the perfect height. It’s better to have a keyboard stand. Keyboard stands come in all colors and sizes and are usually not very expensive. Most electronic keyboards respond to the pressure applied after hitting the key. This is called aftertouch. Aftertouch is often used to control vibrato, volume or other parameters. MIDI (Music Instrument Digital Interface) is a protocol for the communication of sound information between a sending device (for example a MIDI keyboard) and a device that receives the information and produces sound (for example a sound module). The information doesn’t contain the actual sound, but information of which note is played, how long it is played, which instrument is played, and so on. Multitimbrality is the ability of a keyboard or sound module to play different instruments simultaneously, which enables you to play a whole band. When for example a keyboard or sound module is 16 part multitimbral, this means that it can handle 16 different instruments simultaneously (over 16 different MIDI channels). Polyphony refers to the maximum number of notes that a keyboard or sound module can produce at one time. When using the 10 fingers on your both hands, you would expect that 10-note polyphony would be sufficient. But when you use the sustain pedal, you quickly need more than 10 notes at the same time. When playing several instruments together with a sequencer, notes can also quickly add up. Modern keyboards can have a polyphony of 128, 192 or even 256 notes. A sequencer is a programmable device that can play sequences of notes, chords and rhythms that can be transmitted via MIDI signals to a keyboard or sound module. A sequencer can be a hardware device, but also a software program. A keyboard with velocity sensitive keys responds to the speed of the key-press. A higher speed results in a louder note. This imitates the acoustic piano where the speed of the key-press determines how fast the hammer hits the strings which changes the volume of the sound. Apart from very cheap toy pianos, practically all the modern electronic keyboards are velocity sensitive. Did you find the information you were looking for? Do you have a better idea of what the best piano for you is? Please let us know and leave a comment below.